Tonight we pass on the lighter side of chocolate. We go for pure. 100% pure cocoa. No sugar. None. And to add to the imminent drama, we put two heavyweights head to head. For a battle. A flavor battle. Let’s get ready to ruuuumble! 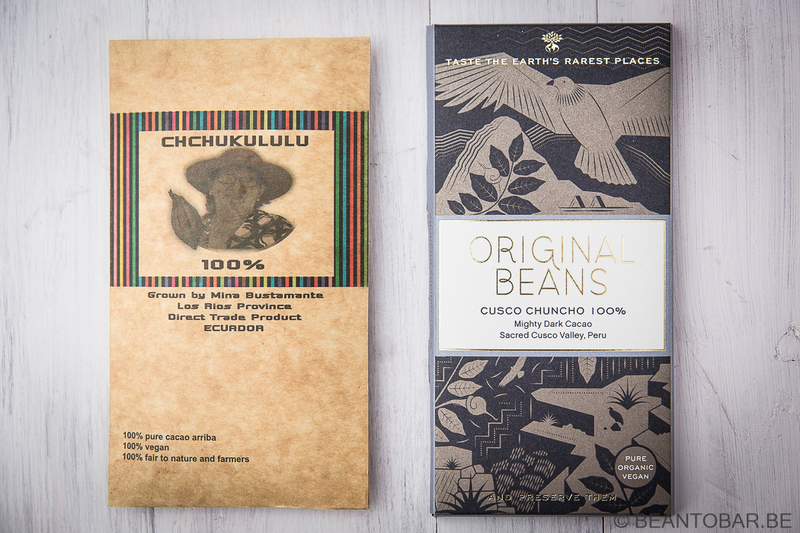 On the right hand side we have Chchukululu’s 100% arriba bar. Straight from the Los Rios Province in Ecuador. 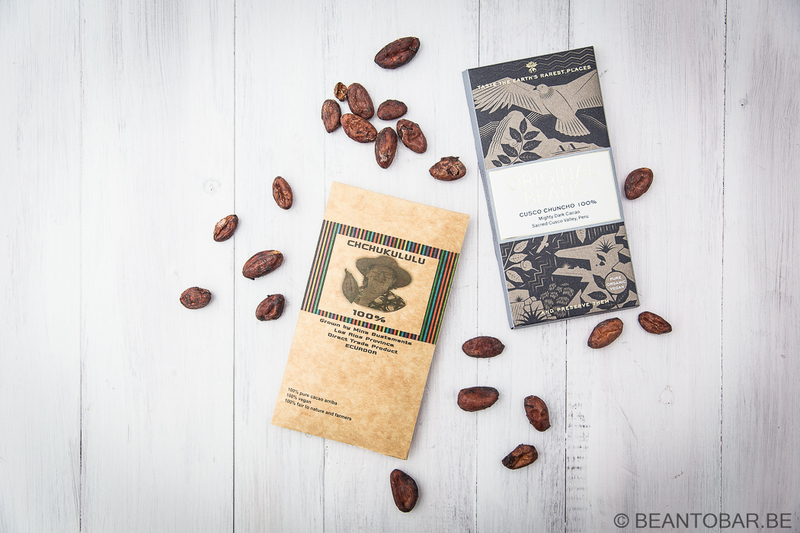 The story behind the brand marks the beginning of a major change in the cocoa trade in Ecuador. Prior all the cocoa grown here was exported. Since early 2000 however, Chchucululu became a prime example of direct trade. Lourdes Delgado initiated the project, creating a better life for the farmers, while ensuring the cocoa production remains eco friendly and helps preserve biodiversity. You might have to read the name twice, but read it slowly and you will never forget it again. On the left hand side we have Original Beans. This company was founded by a group of cocoa experts who search for the rarest cocoa’s on our planet and turn these valuable seeds into cocoa farms with two things in mind: making high quality chocolate and conserve our precious biodiversity. This is done by creating natural, polyculture farms reminding of the woods where cocoa originally came from. But they don’t stop there, they reduce their carbon footprint – from transport, production all the way up to biodegradable packaging. Making the world better through chocolate. 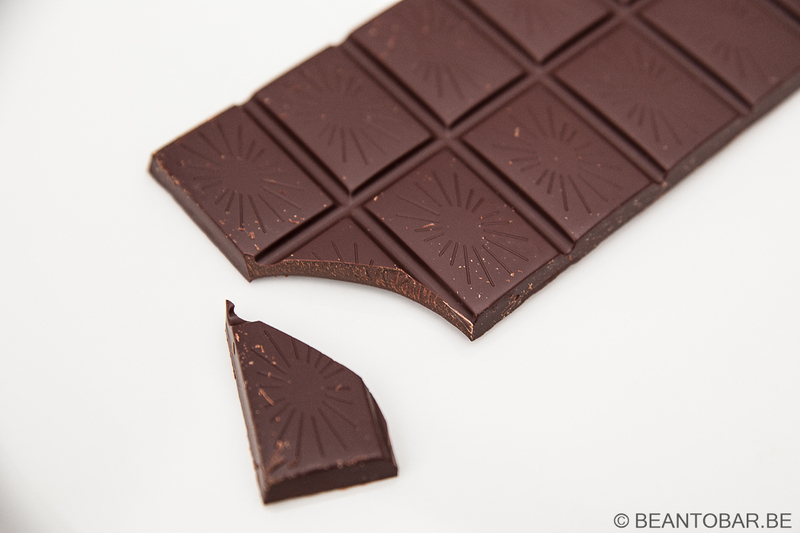 The 100% bar they make is produced with cocoa grown in Peru – more precisely in the Cusco valley. Sizing up the chocolates about to unleash their might, you will notice they aren’t your average chocolate bars. Chchukululu’s bar is wrapped in a cardboard sleeve, decorated with the colorful rainbow colors typical for the brand. Central, a picture of a lady. Not just a lady, but Mina Bustamante who grows the cocoa used for this bar. An ingredients list? You won’t find one. Because there is just one: 100% arriba cocoa. CCN-5 free, as stated on the back. The design of the bar is straightforward, but neat. Rectangular pieces with an native looking decoration. The lady on the package smiles at you. Sizing you op. Wondering if you got what it takes to savour this bar. Orignal Bean’s Cusco Chuncho bar comes in a cardbord box. The main color is grey. It oozes darkness, while showing a condor and the Andes mountains. There is no mistake about the origin of this bar. No ingredients here either: 100% cocoa mass. The bar inside shows the typical Original Bean design. Simple and effective. A bar of this percentage doesn’t need any extra bells and whistles. The flavor is all it needs to overwhelm you. And now for the main event. How do these two bars hold up against each other? Taste: it starts of with a dry, slowly releasing generous building chocolate flavors with a dark heart and crips roasted nuts. Resists to melt. Suddenly your are hit with the full impact of the 100% bar, with a dash of acidity, yet making the flavors a lot more lively. Nutty flavors pop up again and dance around. Some hard to describe floral notes appear, especially when alowing some air in the mouth. 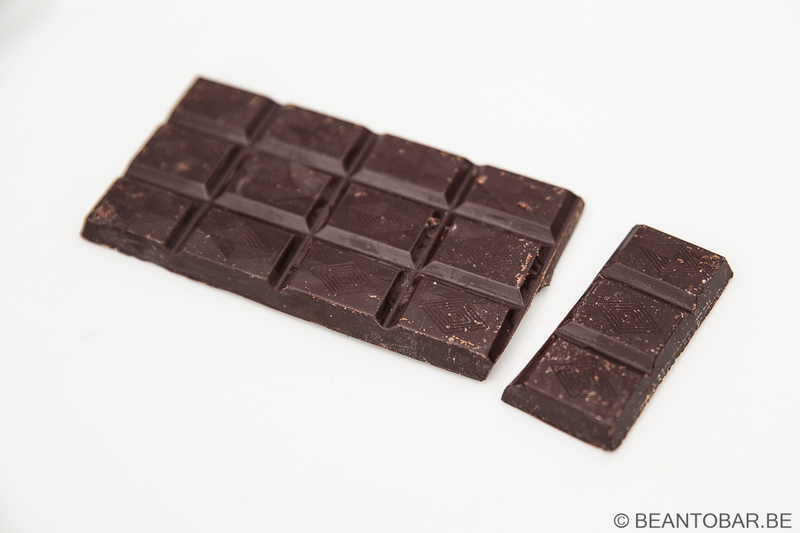 The chocolate is not as astringent as some other 100% and remains very enjoyable for people who like earthy chocolates. The aftertaste is still intense and keeps running, offering more fresh chocolate notes and the intruiging floral notes who become clearer. Taste: starts with earthy grass notes, combined with green banana. The 100% kick of the bar and astringent sensation comes sooner and more swiftly than expected. The great chocolate flavors remain in the back, reminding me of raisins and vanilla. The texture is wonderfully lush. The chocolate keeps releasing its wonderful flavour right until the end of the melt. The intensity drops back and the flavor flows into the aftertaste. High on chocolate and roasted nuts, it remains very enjoyable in the mouth and rolls back and forth. Both bars show a very different character. The Chchukululu chocolate takes more time to discover. It fights back before it melts in your mouth. It twirls around on your palate as the flavors are released. The astringent heart punches you suddenly, but also opens up more flavor notes. It teases and taunts you. Comes close and pulls back again. But in the end, you’ll fall for the abundance of well rounded flavors. The Original beans bar has a faster pace. It melts quicker, zaps left and right with flavor notes. It puts you on the wrong leg with its sweet aroma but gets you back with a touch more acidity than the Chchukululu bar. It is way more direct and lets the flavor notes come over you in a wave. It took me quiet a few tasting sessions to figure out which one I like the best. Finally the Chchukululu bar wins on points for me. Not by a lot, but it just delivers its flavors more harmonious and subtle. People who like a silky texture and a slightly higher punch will appreciate the Original Beans better. Not everyone will like the power of a 100% bar. Even I wouldn’t grab for it every single time. But there is something very satisfying in savouring it from time to time and to let you be taken away by the true flavors of pure cocoa. You should at least give it a try once if you truly love chocolate.